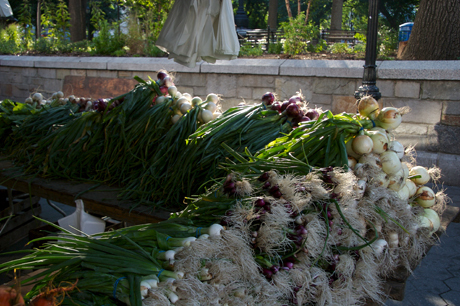 I was lucky enough to stumble upon the Union Square Greenmarket on my very first morning in New York City. 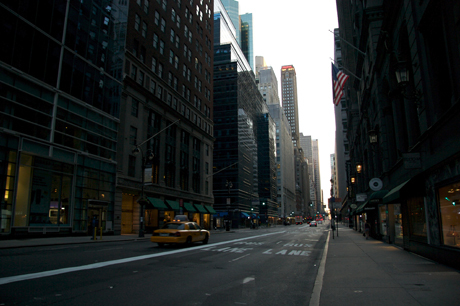 As I was jet-lagged and on a crazy sleeping schedule, I was up and out walking in midtown Manhattan at 5:30 a.m. It was a beautiful morning and the only people out were those with running shoes on their feet or dog leashes in hand. I had no idea where I was headed but sometimes there is nothing better than just wandering around a new city alone, absorbing the sights, sounds, and smells. I walked past the lions guarding the New York Public Library, stared up in awe at the Empire State Building, and wandered through Madison Square Park, stopping for a moment to watch some dogs playing in the little dog run area. I realized that New Yorkers are very friendly in the early morning as I received many smiles, “hellos,” and was even introduced to an adorable bulldog named Gino. As I continued wandering, I came upon the Union Square Greenmarket just as the trucks were unloading and vendors were beginning to set up. It was an unexpected and wonderful surprise as this particular Greenmarket was high on my list of things to experience in NYC. It was the best farmer’s market I’ve ever seen and all of the vendors I spoke with were very friendly and full of information. I was impressed not only with the quality and variety of items for sale but also the reasonable prices. I spent a couple of hours wandering around, taking photos, talking to people, and of course, eating. I bought blueberries, raspberries, fresh organic yogurt, a loaf of olive bread, a log of herbed goat cheese, a basket filled with cherry tomatoes of varying sizes and colors, and a cup of fresh basil and mint iced tea sweetened with honey. I ate some of it for breakfast and packed the rest into my backpack for lunch. I also picked up some recipes and flyers from the Greenmarket information booth and I want to share some interesting information about buying local food. 1. Local food tastes better — Food imported from far away is older, has traveled on trucks or planes, and sat in warehouses before it finally gets to you. 2. 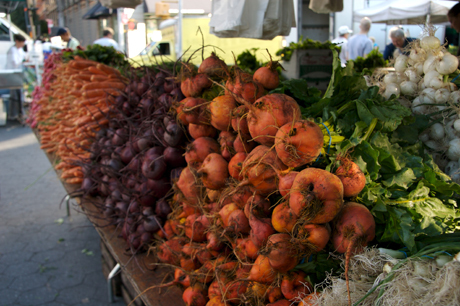 Local produce is better for you — The shorter the time between the farm and the table, the few nutrients will be lost. 3. Local food preserves genetic diversity — In the modern agricultural system, plant varieties are chosen for their ability to ripen uniformly, withstand harvesting, survive packing and last on the shelf so there is limited genetic diversity in large-scale production. 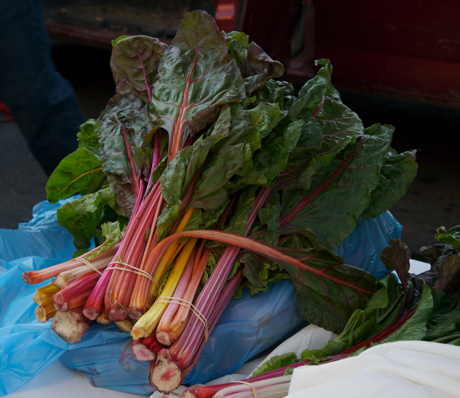 Smaller local farms often grow many varieties in an array of colors and flavors. 4. Local food is safe — Local farmers aren’t anonymous and they take their responsibility to the consumer seriously. 5. 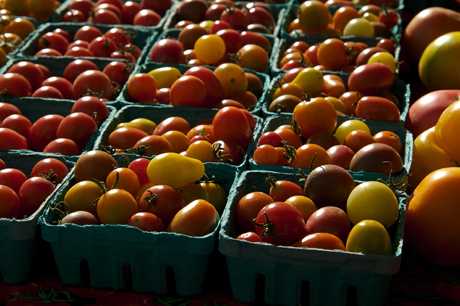 Local food supports local families — Wholesale prices are low, often near the cost of production. Local farmers who sell directly to consumers cut out the middleman and get full retail price for their food, which helps farm families stay on the land. 6. Local food builds community — When you buy direct from a farmer, you’re engaging in a time-honored connection. Knowing farmers gives you insight into the seasons, the land, and your food. It gives you access to a place where your children and grandchildren can learn about nature and agriculture. 7. Local food preserves open space — When farmers get paid more, they’re less likely to sell their farmland for development. When you buy locally grown food, you’re doing something proactive to preserve our agricultural landscape. 8. Local food keeps taxes down — According to several studies, farms contribute more in taxes than they require in services, whereas most other kinds of development contribute less in taxes than the cost of the services they require. 9. Local food benefits the environment and wildlife — Well-managed farms conserve fertile soil and clean water in a patchwork of fields, meadows, woods, ponds, and buildings that provide habitat for wildlife. 10. Local food is an investment in the future — By supporting local farmers today, you help ensure that there will be farms in your community tomorrow. This information was provided in the form of a flyer at the Union Square Greenmarket in New York City and was reprinted from “With an Ear to the Ground” by Vern Grubinger. 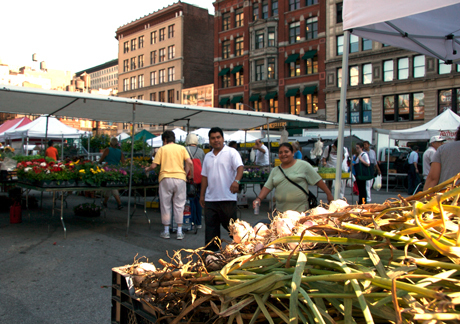 To learn more about New York City Greenmarkets, visit Council of the Environment of NYC and click on the Greenmarket section. « New York, Chicago, New York? Nicole, I truly enjoyed reading this one. Your beautiful photos take me back to the sights and smells I experienced while visiting there! Thank you for providing great reasons to buy local produce, great tips! Very enjoyable read! Oh I love that market--I was just there a few months ago, and I also stumbled up on it (knowing I wanted to check it out but finding it before I could look up its market hours). It is amazing to have a market like that in the middle of a metropolis (we have the San Franciso Ferry Building Farmer's Market...and although it's adjacent to the Financial district, it's on the water and not surrounded on all sides by skyscrapers and dense housing for miles).Anyway--I enjoyed this read and it brought back good memories.And yes, thumbs up to buying local produce! I loved reading Michael Pollan's "Omnivore's Dilemma"
Yes to all of this! 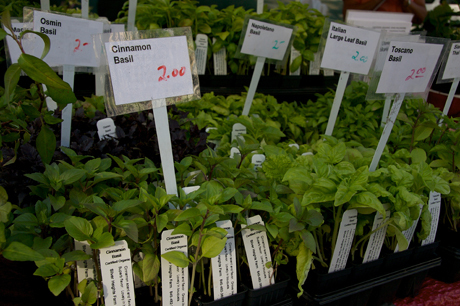 So glad you were able to discover the Greenmarket -- one of the best places to visit in New York City. Wonderful photos, too. Beautiful photos and I really enjoyed the narrative. Also, I'm not sure if I've ever seen purple peppers. Very cool. Great post, and great photos as usual. I can only imagine how wonderful this market is. Food, Glorious Food... What a fantastic market! Great photos and I love the 10 reasons... they're so obvious...once you know! Thats all great, but did you get a cup of coffee in one of those blue paper cups with the Chinese writing on it? Also, did you get my text message? 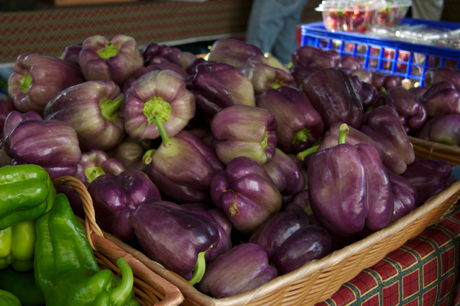 Wow, I've never seen purple peppers before! Nicole---A fabulous post. I love New York for a lot of the same reasons you expressed here. Even on my first visit, it all felt so familiar, like I was seeing places I'd seen all my life. 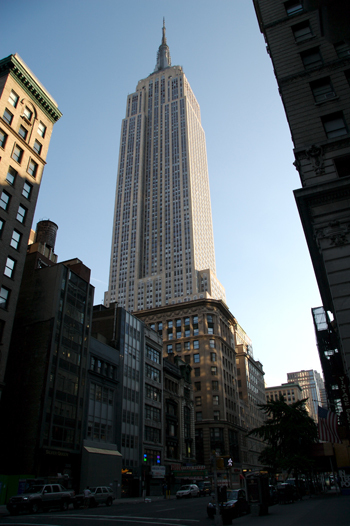 Which I of course was---everything in New York has been photographed and filmed so many times. And it would all happen so unexpectedly. My first glimpse of the beautiful Chrysler Building came as I looked up from writing a postcard as I sipped a glass of wine in some little Murray Hill restaurant.You're right about the people too. Quite friendly---gregarious even---just at a faster pace. What a beautiful post to read on a Sunday morning. Thank you! Anyone interested in reading further on this topic should run out and get Barbara Kingsolver's new, fantastic memoir, ANIMAL VEGETABLE MIRACLE. It is sooo good. These are beautiful photos of the city. Morning light shows a lovely and rare innocence in NYC. Thank you, thank you, thank you for such beauty and inspiration. 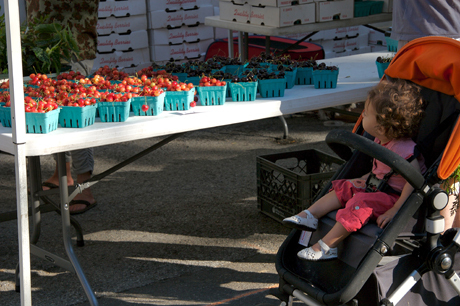 Nicole, these are great photos -- I can almost taste those little tomatoes and smell the flowers. I'm so glad you're enjoying exploring New York! 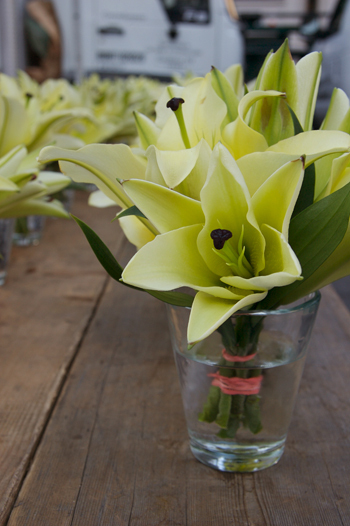 We support local markets and Mom & Pop stores... for the very same reasons. That is what buying American means~ inspite of what Walmart may want us to think. this was great reading! I visited my first farmer's market last year and I've loved going since! So nice to see some pics from your travels! Wandering a city alone is one of the best things to do. I'm so glad you are having an adventure!! what a beautiful post. i loved every picture and all the reasons... i'm from nyc and miss that market terribly. when i left it was just getting going. 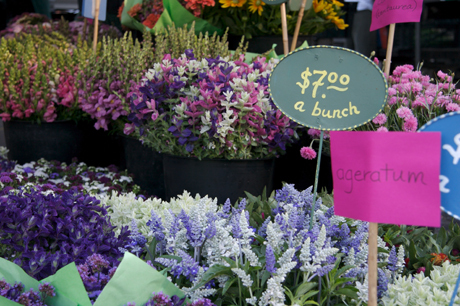 now it's one of the coolest green market going! Wow! I'd *love* to buy this standard of fresh produce. I really must start to look out for these markets. There should be a few in my neck of the woods.Great post, Nicole. Your photography is first class! I am so glad that you all enjoyed this post! Sorry I haven't been responding to comments as much as I normally do but I love to hear you...even when I'm traveling :-)Christine: I haven't read Omnivore's Dilemma but I've wanted to for a long time. I'll pick it up soon!Terry B: EXACTLY! !Alison: Thanks, I'll check it out!Misslionheart: I hope you find something near you! 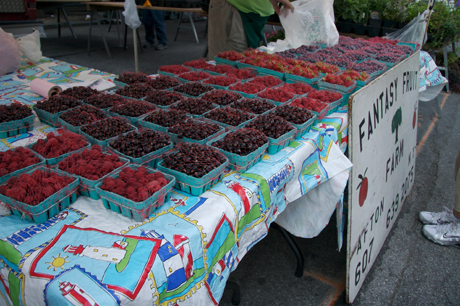 The best thing about shopping at these markets is that you can talk to the people who are growing the food. If you see something unusual, you can ask about it and find out what it's used for. It seems like I learn something new whenever I visit an outdoor market, regardless of whether it's in Italy or the U.S. I went to HS across the river and would find myself down in this area of Manhattan all the time...especially at the Barnes & Noble on 17th...this brings back memories. How are the prices now? I remember back then...it used to be a little cheaper than I am probably expecting it to be right now. Does anyone have any idea where to buy a pumpkin in Manhattan? this site should give more detailed descriptions instead of stating facts people already know!! I really like your article?? ?